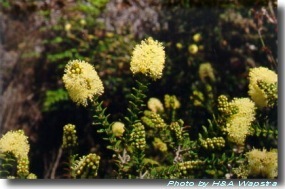 Small bottlebrush-like flowers which are usually pale yellow. Common in shallow gullies and damp areas in heathlands and forests.Widespread and abundant in damp sandy soil. Resistant to Phytophthora cinnamomi. Susceptible to browsing by possums and wallabies. A good street tree and screen and hedging plant. Will shoot back from a woody root stock after coppicing. Not suitable below powerlines. Keep very damp after sowing. Seed gives good germination. If no growth is evident 2 weeks after germination soluble fertilizer may be used. Bog method is very successful.